In this article we will look at methods of dander control. To learn more about pet dander please read our article "What is Pet Dander? Dander is very sticky. It sticks to our clothing, furniture, and carpets. It is lightweight and floats in the air for a long time. If we or someone in our house has an allergy, the best thing to do is to get rid of our pet. Some of us could not bear to be parted from our best friend. What do we do? It is possible to have a pet dander allergy and live with our pets. It will take a little work on your part, but it is doable. The following checklist are things you should do. Here are some steps to follow to help you prevent dander allergies. Establish a no pet zone. We recommend your bedroom. Dander can stick to the bed sheets, furniture, curtains. You will spend about 8 hours a night here. Make it allergen free. 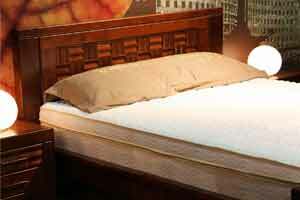 It is a good idea to get allergen blocking covers for your mattress and pillows. Use an air purifier with a HEPA filter to remove dander from the air. We have reviewed many air purifiers on this site. Please read them and let us help you pick the perfect air purifier. Wash you pet at least once a week. Use a good dander reducing shampoo. Keep your pets well groomed. More hair means more dander. Vacuum your carpets daily. Use a HEPA filter. The cat's litter box should be in a remote location. The person with allergies should not change the litter. If you follow these steps there is no reason why you can't live in harmony with your pet. Just because you don't have a pet doesn't mean there is no dander in your house. We go to work in an office. Our coworker, Susan, has a cat. That morning the cat rubbed all over her legs, like cats do. Now her pants legs are covered with cat dander. Susan comes to work. She sits down in a chair at work. This chair now gets dander all over it. People are constantly sitting down in and getting up from this chair. Each time that happens dander gets thrown into the air. You sit down in the chair. Now dander will stick to your clothing. You walk around the office and more dander sticks to your clothing. You go home and sit on your sofa. Now dander is on your sofa and in your carpet. Each time you walk around you send the dander back into the air. Now you are right. It is just one person and just one time. But how many of your coworkers have cats. And they will pet their cats everyday before work. Everyday you bring home more and more dander. Sounds nightmarish doesn't it? Even if you don't have a pet, it still makes sense to have some sort of dander control plan. At least get an air purifier. They will remove most of the dander you track into your house. Read our reviews of our most recommended models. Leave The Dander Control Page and Return to Air Purifiers, Asthma, and Allergies Page. Leave The Dander Control Page and Return to All About Air Purifiers Home Page.